l O'Meara Camping Custom Gazebo Hints & Tips. Why choose a Custom Printed Gazebo over a Regular Canopy? At O' Meara Camping we believe in selling you what we think is best for you. Like most companies or sole traders you want to make money! If this means buying the basic shelter first then this is the best option for you. We advise all our customers on which frame type we believe is best suited to them. However, if you want to make the best and most productive impact on your client base then the Branded Gazebo is for you. 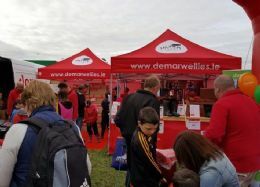 The Branded O'Meara shelter stands out from the crowd and allows your potential client base see you and notice you first. This will leave a lasting impact. 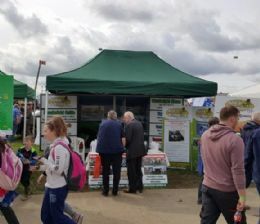 Here are a few examples of shelters taken at the Ploughing Championships. What do you think? Which Gazebo stands out more strongly to you? If I decide to go ahead with a Branded Gazebo what do I need? To start, we will discuss with you over the phone or via email what you are looking for. Once that has been done, O’Meara Camping will draw a Free Mock Up of your design. 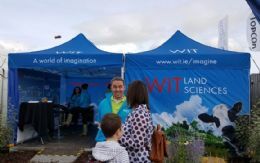 If you know at this stage that you would like to go ahead with a Printed Gazebo a non-refundable deposit of € 100.00 is taken and then we both begin the task of getting your artwork correct. You can change layout and colour etc. 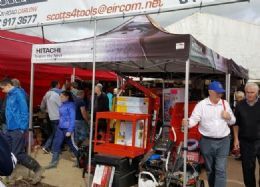 as many times as you like but once the artwork is finalized and signed off on a further deposit of €100.00 – €600.00 is taken, depending on the amount of printing that needs to be done and the size of Gazebo you have selected. Then your artwork is sent off to our factory for printing. It is not possible from then to make any further changes. How long does it take to print my Gazebo? Once the artwork is finalized and signed off the Printing job can take “Up to 3 weeks”. If you have to have your printing back sooner than 3 weeks call O’Meara’s to discuss this. O'Meara Caming will never take on a job that has very little time to allow for printing. Artwork is processed in our Factory in The Far East and Air Freighted in to Ireland. What if I do not have a Logo or Any Artwork to give you? This is common. A lot of Sole Traders or new companies will not always have the artwork they need to start printing a gazebo. I have a company that I have used for all my own artwork and they are very professional and extremely reasonable. What file type do you require for my Printing Gazebo? Preferably we require a VECTOR format file of your Logo or artwork design as this is the only format that will allow the file to be stretched to fit on a large canvas print. JPEG files for those using photographic files are also permitted. We require a High Resolution Image of minimum 300dpi 400MB. Some files will be too big to send via email. We suggest that you send photos by "WeTransfer". What if I don’t have a good enough file for printing? If your logo is not a good enough file size for printing we are generally able to get it redrawn. There is a small cost for this approx. €80 – €140.00 depending on the logo or file type. Aftercare of my Printed Gazebo? 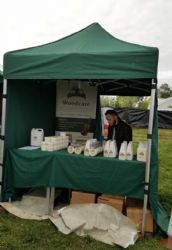 From our experience of dealing with Printed Gazebos they are made of 600 x 600 Denier Material but feel lighter to touch than the Polyester 380gsm or 450gsm versions that we sell off the shelf which are unbranded. If you leave your Branded Gazebo Canopy on your frame then the fabric can get caught in the cross bars which close around the fabric causing the material to pinch. Pinching can cause holes in your fabric. If you leave the canopy on your frame and push the shelter in and out of jeeps, cars and trailers rubbing the fabric against rough surfaces this will also cause overdue tension and abrasion to your canopy. This sort of wear and tear would not be covered under warranty. O’Meara Camping Care Advice is: Store your canopy away from the frame. It only takes a few seconds to put the canopy on and off your gazebo frame. This small change will prolong the life of your Branded Gazebo. The Printed gazebos are laser printed onto initially a White coloured 600 Denier fabric. The printing is done before the fabric is cut. It is then placed in a room to dry. Once dried it is cut and stitched together to create your Canopy, Side wall or Table cover. The material is backed with a light PU coating to make the fabric waterproof. Your Branded Gazebo is then packaged and sent to O'Meara Camping. We check all finished products that come into us before giving them to our clients. You are also advised to fully check your order. Once everything is perfect it is your responsibility to take care and mind your Gazebo. Each customers Branded Gazebo colours are different and we only use a select amount of thread colours for stitching the border seams of our gazebo range. The thread will be white, Green, Red or black generally. Your border hem will also be the same and the factory staff will decide which looks best. If you require something different we will need to know as soon as possible and we can see if your requirement can be matched. What does the inside of my Gazebo look like? As the material is laser finished starting on a white piece of fabric the inside of the walls and roof will remain white unless you have selected and paid to have printing on both sides. It is common for printing on both sides of the side walls but rare for the roof to be printed on the inside. O Meara Advertising on your Gazebo! 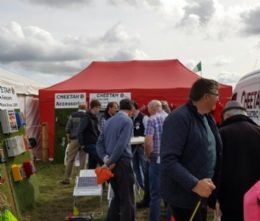 O'Meara camping do not take away from our clients printing in anyway by having any of our own branding or logos printed onto the outside of your canopy. On the inside corners there will be a small tag with our details which you can easily remove if you wish. Any Pantone can be selected for printing sometimes the shade of colour from an Image or PC colour can change ever so slightly when printed. Please bear in mind that unless you are also intending on having all your sides walls printed to match this pantone colour we only have a certain amount of colours which we keep in stock such as: Red, Black, Green, White, Navy and a few others from time to time. My Side Walls what will I get? If printing on side walls the print involves the entire side panel. These side panels do not have a window panel or door as standard. If you wish to have a door you must specify what size height and width door you require prior to printing and we can have the zip stitched into your side panel.